Made with honey sweetened dough, walnuts, coconut blossom sugar, more honey and a touch of cardamon spice this bread was delicious and went just fantabulously with my afternoon tea! I added ground turmeric into my dough mixture to give it a beautiful citrine shade and a mild flavour of the Middle East and India. Besides the lovely colour and a piquant taste, turmeric carries many wonderful healing properties. I use this spice frequently in many of my recipes for the above-mentioned reasons. This is a fairly large bread, as it happens I’m never able to make small bread. I love eating bread and so do my kids so big breads are never going to waste here only to waist 😉 mine that is! Little hands hard at work! Place milk and butter into a microwave safe bowl, microwave for 1 minute or till butter has melted. Mix in the honey and turmeric, stir well, then add water and yeast. Sieve the flour into a bowl of a stand mixer or any other large bowl. Make a well, add milk and water mixture in and knead into a dough. Continue kneading for 3-5 minutes. The dough has to be soft, if it’s too sticky add more flour, but very little at a time. I try to keep my dough soft as it gives a nicer textured bread. Knead the dough into a ball and place into a lightly oiled bowl, cover and leave to double in size for 1-2 hours. It’s summer here in Australia and my dough has doubled in size in less than an hour. In the meantime while you are waiting for the dough to raise prepare a walnut mixture. Place walnuts into a food processor and process till finely ground. Move into a bowl and mix with the 2 tablespoons of coconut blossom sugar. In a separate bowl mix honey and softened ( not melted ) butter till forms a smooth paste. Once your dough has doubled in size punch it down and lightly knead into a ball. Move the dough on lightly floured work bench. Roll out into a 55x40cm rectangle. Spread honey and butter mixture using the back of a spoon, then sprinkle with walnut and coconut blossom sugar. Roll into a roll. Move on top of prepared baking paper, that will make it easy to move it without hassle on a baking tray. Cut in half diagonally and braid by placing one-half on top of another and so on. As you braid the halves, keep them cut side up as much as possible. Bring both ends together creating a circle, tuck one end under another. Carefully slide by pulling the ends of baking paper on a baking tray. Leave to rise in a warm place for 30-45 min. Lightly beat an egg in a bowl. Brush bread with an egg and bake for 35-40 minutes. If browns too fast cover with another piece of baking paper or foil. Remove from oven and cool. Can be enjoyed while still warm :). Happy Baking! Slide on a baking tray. Let to raise, then brush with a lightly beaten egg. Soft and delicious these are the kind of scrolls you would call a comfort food. Flavoursome they are very hard to stop at just eating one. 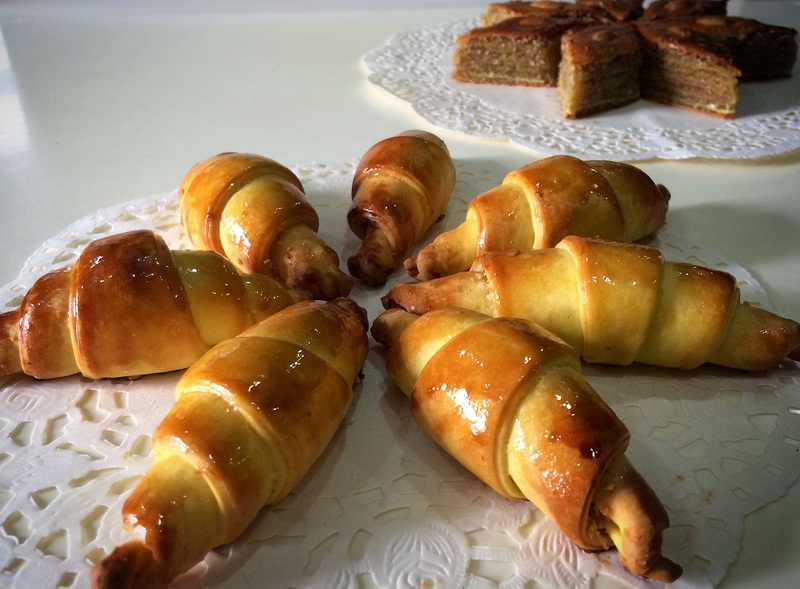 They went like hot buns here yesterday, which they are in a way – hot, yummy buttery buns with a twist. Perfect for kids lunch box or after school snack. In a large bowl dissolve yeast in water, add milk, olive oil, salt and flour. Knead well for 5 minutes. Your dough should be very soft but not sticky. add more flour, but very little at a time if your dough continues to be sticky. Cover and leave to rise till doubled in size 1-2 hours. Prepare a round 22-24cm cake pan, lightly oiled. In a bowl mix melted butter with garlic and herbs. Place dough on a lightly floured bench or board. Gently stretch using hands or roll with a rolling pin into a rectangular shape 40-45cm in length and 25-30cm in width. Spread butter and herb mixture using a spoon or hands. Spread crumbled feta and sundried tomatoes over the top and gently roll into a log. With a sharp knife cut the log into 10 equal in size pieces. Place them into prepared pan equally spacing one from another. Let to rise till doubled in size, approximately 1 hour. Brush bread scrolls with egg wash and bake for 40-45 minutes. To avoid over browning cover with baking paper or tin foil halfway through baking. Remove from oven. Slightly cool and enjoy while still warm. 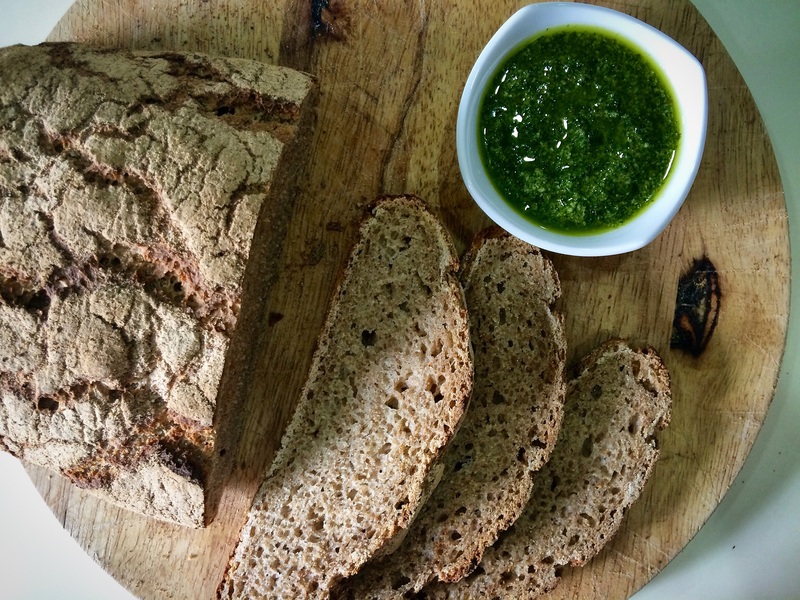 The combination of buckwheat and brown rice flours in this bread give it beautiful earthy flavours. It is light and soft in texture and I love the contrast seeds create and that nutty taste they bring with them. Consisting of only four kinds of flour and a handful of other ingredients, it is a fairly easy bread to bake. The time required for the whole prosses is quite short as well, in comparison to many other bread recipes. The dough, which resembles a thick cake batter, is quite a bit liquidy. The reason for the liquidy dough is that both buckwheat and brown rice are fluid absorbents. I added pepitas and sunflower seeds into the dough and reserved some to sprinkle over the top. Both pepitas and sunflower seeds are packed with healthy oils and nutrients. Sunflower seeds are an excellent source of essential fatty acids, vitamins, and minerals. They are rich in antioxidants, contain vitamin E and are a great source of the B-complex group of vitamins. Pepitas aka Pumpkin Seeds are known for curing intestinal parasites and are rich in unsaturated fats. They are full of fiber and provide a great number of nutrients including magnesium and amino acids. The components in pepitas can have positive effects on sleep, anxiety, mood, appetite and pain. 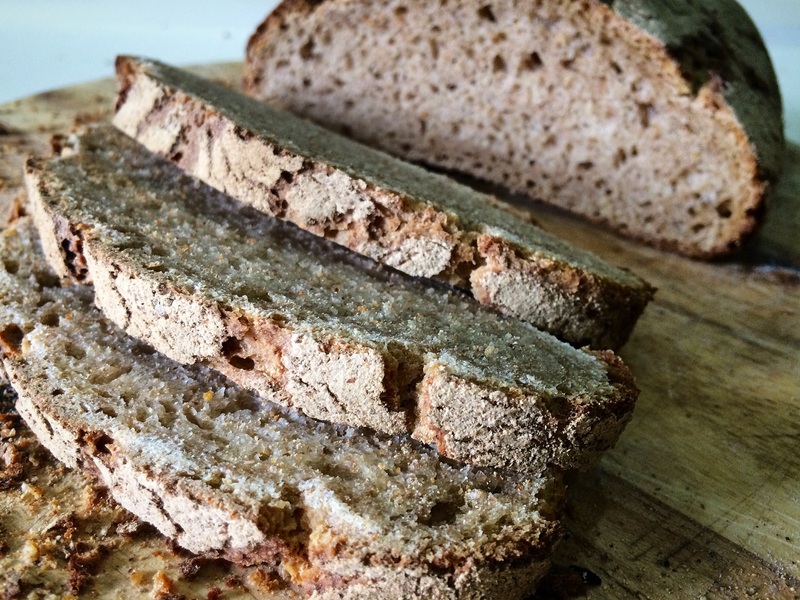 The main ingredients in this bread, buckwheat, and brown rice, as well are full of nutrients and vitamins, fiber and many other health-boosting qualities. In a large mixing bowl mix water, honey and yeast. Cover and leave in a warm place for 10 minutes to activate the yeast. Add the rest of the ingredients, reserving a handful of seeds for later, and mix well. The mixture should resemble a thick cake batter. Cover and leave to sit in a warm please for 20 minutes. 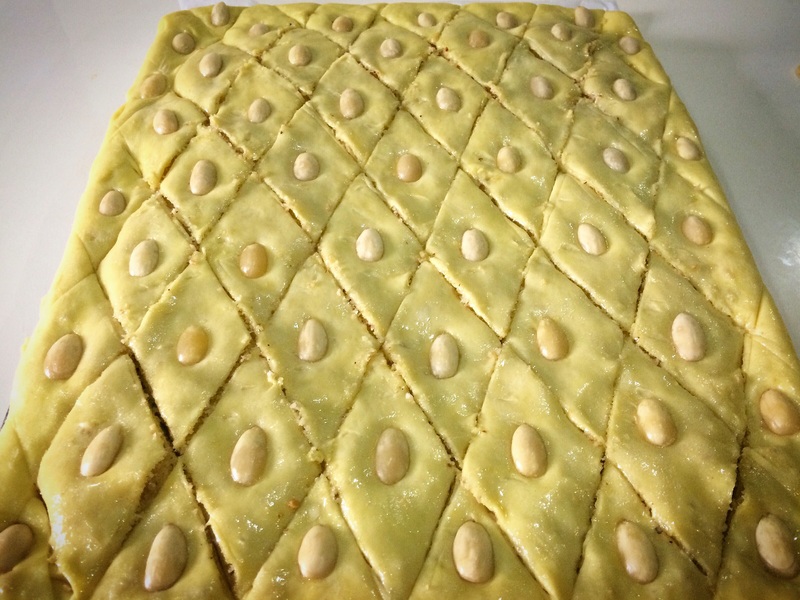 Gently move the batter into an oiled 24x14cm bread tin, sprinkle with reserved seeds, cover and leave in a warm place for 30 minutes to 1 hour or till reaches the edges of the tin. Bake in preheated to 180C oven for 45-50 minutes or till cooked through. To check if the bread has cooked through, insert a skewer and once it comes out dry the bread is ready. The bread stores well for 2-3 days in an airtight container in a pantry and longer when refrigerated. When slicing this bread, it is best to use a good bread knife and slice slowly through the crust to prevent it from crumbling. I was born and grew up in beautiful Baku, Azerbaijan. Bread is a staple of any meal in my home country, and this flatbread is a very traditional type of bread that is cooked in a wood fire oven called tendir, which is where the name of this bread originates. It is the most delicious bread in the world to me and I missed enjoying it a lot when I moved to Australia so one day I decided to attempt to make my own tendir bread. 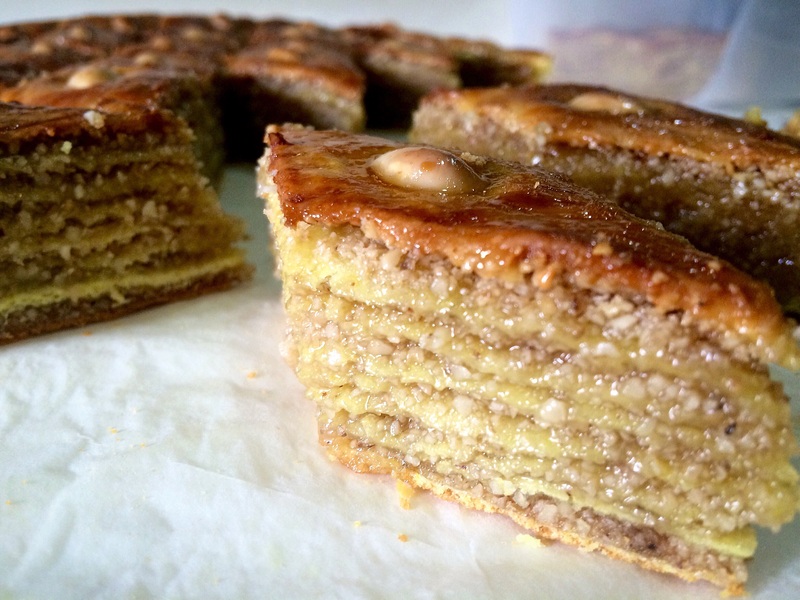 After a few experiments, it worked and now I’m so excited to share this recipe with you all. Dissolve yeast in lukewarm water and set aside till becomes frothy. Sieve 3 cups of flour into a large bowl. Make a well, add olive oil, plain yoghurt and yeast mixture, mix well. Start adding more flour if needed, but very little at a time as you may not need to use full four cups. The texture of this dough has to be very soft. It will be very sticky at first, but after a few minutes of kneading it should become more elastic. If the dough continues to be sticky add more flour, but very little at a time and continue kneading. Once your dough is elastic place it into a lightly oiled bowl, cover and leave in a warm place for 1-2 hours or till doubled in size. Prepare a baking tray about 45 cm in length. Place 45 cm long piece of baking paper on top of the working bench. Lightly knead the dough, and move it on baking paper. Wet your hands and stretch the dough into a flat oblong shape. You may need to wet your hands a couple of times to avoid the dough from sticking to them. Make 4 equally linear indents with the outside edge of your hand. Leave your bread to sit in a warm place for 40-50 min. Brush with an egg and repeat the indents with the edge of your hand once again. Sprinkle with seeds and bake for 30-40 minutes or till cooked through. Cool, and enjoy :). I have updated the recipe with additional step by step pictures for this aromatic and delicious pull apart garlic bread. It’s a yummy bread that is packed with flavour, and it’s so much fun making it :). My 5-year-old daughter loves helping to make it, and then, of course, eat it in par with her little brother and friends :). I grow my own herbs regardless of where I live; be it in an apartment or back in our house in Australia. There we have a lovely veggie patch where we organically grow our own herbs and vegetables. There are absolutely no tricks to making this bread; it’s easy and straight forward. The amount of flour may vary from brand to brand, as some are denser than others, and may require a lesser amount to use. When I make bread using a new brand of flour I start by adding half of the amount and gradually increase until the dough is soft and elastic. Kneading is important as it makes the dough come together and gives it more elasticity. I usually knead for about 10 minutes. The amount of herbs used in this recipe can be increased or decreased, depending on preference. The kind of herbs are used can vary depending on what you can get your hands on, and again, depending on what flavours you and your family prefer. I can never skip using rosemary in this recipe as it’s so fragrant, and I love the smell of it in the combination with garlic. So here it is, my recipe for pull apart garlic bread! Dissolve yeast in a bowl of lukewarm water and set aside till becomes frothy. Sieve the flour into a large mixing bowl and make a well, then add salt, yeast mixture, oil, and lukewarm milk. Knead for 8-10 minutes into a soft dough. Place dough into a lightly oiled bowl. Cover with a damp towel and leave in a warm place to rise till doubled in size 1 to 1,5 hours. In the meantime, prepare garlic butter by mixing all ingredients together in a bowl. Preheat oven to 200C and prepare a 24×12 cm bread tin. Punch the dough down and lightly knead. Place the dough on a lightly floured surface. Roll into a log and cut into 18-20 pieces, then roll them into small balls. Prop the bread tin into a vertical position. Flatten each ball with a rolling pin or by hand. Spread about a teaspoon of butter and herb mixture evenly on one side, then stack one on the top of another into the bread tin. You may require giving the tin a light shake, one or two times half way through the process of stacking to avoid the dough from overlapping. Once finished stacking place the bread tin into a normal position, gently even out the stacks ( the tin will be full once risen ) and brush the top lightly with milk. Cover with a damp towel and leave to rise in a warm place for 45 min to 1 hour. The timing will depend on the temperature and the activity of the yeast, but once the dough reaches the top sides of the bread tin, it’s ready to be baked. Brush with milk and place into preheated oven and reduce heat to 180. Bake for 40 minutes or till cooked through. Once your bread is cooked brush it with more butter or if there are herb and butter mixture leftover brush it on top of still hot bread. The aromas will spin your head.